I have completed my charms and sent them in the mail for Snow White Charm Exchange. The sign ups were a little slow at first so I took three spots. I will have more charms then I know what to do with. We were to make "mixed medium" so I tried to make my three sets from different materials. The witch is a photo transfer onto cotton and them sewn to red wool. 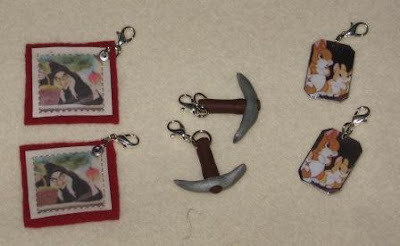 The pick axe is from polymer clay. The bunnies are a photo glued onto a plastic crystal and then sealed with Diamond Glaze. 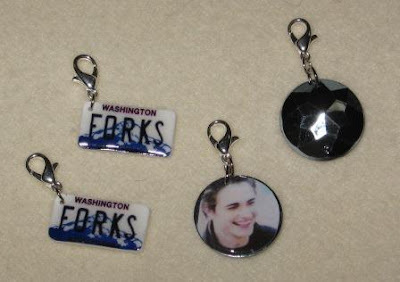 Here are my Twilight Charms. The host of this swap was changed after I mailed mine. The old hostess has not forwarded my charms and 7 other sets. I am worried they are lost for good. The hostess was changed because there had been so many troubles getting swaps back in a timely manner. I hope this does not happen again. I guess this is the risk of swaps. These charms are awesome, hope that you figure out what happened with the mix-up!